Maha Navami is the ninth day of the Navratri festival and is the final day of worship before Vijaya Dashami, the end of Navratri. On this day, Goddess Durga is worshipped in different forms in different parts of the country. When is Maha Navami celebrated? 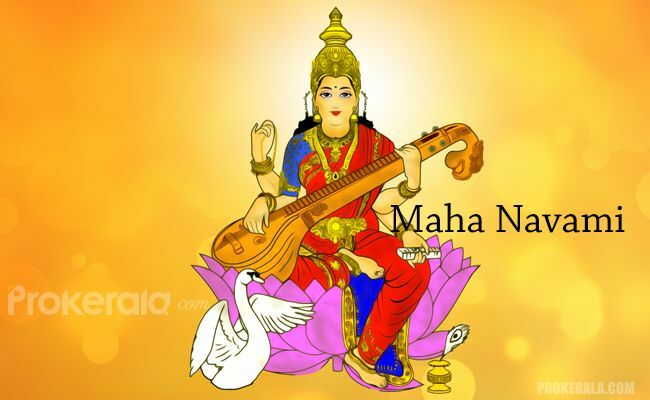 Maha Navami is celebrated on the navam (or the ninth) day of the Shukla paksha in the Indian month of Ashwina. According to English calendar, this falls in the months of September and October. According to mythological stories, Devi Durga's battle against Mahishasur, the king of demons lasted for nine days. The ninth day is the final day before the Goddess won over the evil with her power and wisdom. So Maha Navami is also considered the eve of starting anything new on Vijaya Dashami. On this day, Goddess Durga is worshipped as Saraswati—the deity of knowledge and wisdom. In Southern India, Ayudha Puja is arranged and along with the Goddess, tools, machineries, musical instruments, books, equipments of all kinds including automobiles are decorated and worshipped. This day is considered vital before starting any new work on Vijaya Dashami. Children start going to school on this day in many places in Southern India. In North and East India, Kanya Pujan is done on this day in many places. According to this ritual, nine young virgin girls are worshipped as nine forms of Goddess Durga. Their feet are washed, kumkum and sandalwood paste is applied over them; they are offered new clothes to wear and then they are worshipped with mantras and incense sticks. Special food is cooked for them and they are offered gifts as tokens of love and respect by the devotees. In eastern India, Maha Navami is the third day of Durga Puja. This starts with a holy bath following which Shodhasopachar puja is done. On this day Devi Durga is worshipped as Mahishasuramardini, meaning the Goddess who killed Mahishasur, the buffalo demon. It is believed that on this day the demon was finally annihilated. A special ritual of Navami hom is done at the end of Navami puja. In some areas of Andhra Pradesh, Batthukamma festival is held on Navami. The name is inspired by a beautiful flower. This puja is done by Hindu women and flowers are arranged in a typical seven layer form in a conical shape and is offered to Goddess Gauri—a form of Durga. This festival celebrates the glory and beauty of womanhood. Women wear new clothes and jewellery on this day. Other pujas that are held on this day are Suvasini Puja and Dampati puja. In Mysore, on this day the Royal sword is worshipped and is taken out in processions on illustrated elephants and camels.